Right now is the perfect time to start freezer cooking. Summer produce is at its peak—peppers are prolific, CSA boxes are brimming with tomatoes and corn, and they’re practically giving away zucchini at farmers markets. And as summer is about to end, the days get busier and shorter and it gets harder and harder to take time out for cooking a dinner every night. Making food in bulk and freezing it lets you preserve all the flavors of summer and enjoy them in the form of effortless meals for a few more months. Cooking dinner every night with a new baby has been a challenge, so I’ve been making soups and casseroles when I have the chance on the weekend and freezing them for later. This Slow Cooker Veggie Tortilla Soup from our Guide to Freezer Cooking is one of my favorites for this time of year. It makes use of summer corn and peppers and since it’s made in the slow cooker, it’s pretty hands-off after the prep work is done and it won’t heat up your kitchen when you’re making it. It can be customized with your favorite fixings after re-heating—cheese or sour cream if you eat dairy, avocado and cilantro if you’re vegan. 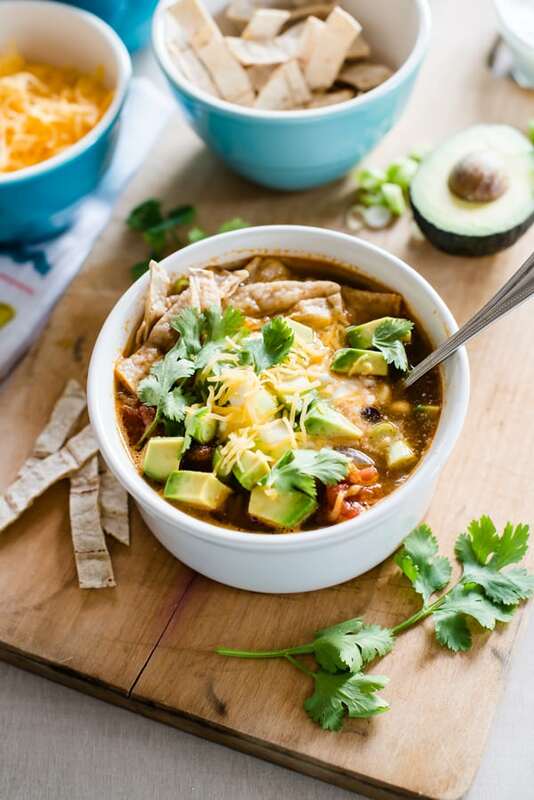 This vegetarian version of tortilla soup is perfect for freezing! the soup in a microwave-safe plastic container, you can use the thaw setting on your microwave to thaw it. Once thawed, cook soup on the stovetop on medium heat until heated through or microwave in a microwave-safe container, stirring every 2-3 minutes, until heated through. Serve with tortilla strips, avocado, sour cream, cheese, fresh cilantro and any other toppings you like. Preheat the oven to 400°F. Using a pizza cutter or large chef’s knife, cut 8 corn tortillas into several 1/2-inch-wide by 3-inch-long strips. Spread tortilla strips in a single layer on a cookie sheet and bake, turning once, for 10-12 minutes, just until hard and crunchy. Remove from oven and let cool. I have been dreading turning on the oven because of the summer heat- I can’t believe I forgot about my slow cooker. This looks like a fabulous soup that I need to make ASAP! What brand of vegetarian broth do you recommend? I haven’t found any that I’ve liked. I usually make my own (here’s the recipe: http://ohmyveggies.com/how-to-make-vegetable-broth-with-kitchen-scraps/), but I buy Imagine and Pacific Natural Foods broth if I’m out of homemade. I really want to make this but don’t have a slow-cooker. Can i cook it in a wok/saucepan on the stove top instead? if so, does the cooking time change? Cheers! How do i make this without a slow cooker? Could you assemble this soup uncooked and freeze it first and then put it in your slow cooker the day you want to eat it? Hi Lori! I think that would work! Your best bet would probably be to chop and prep the veggies and store them in a couple of freezer bags – separating items such as the onions and garlic. Then the day of serving you can crack open a can of beans, tomatoes and broth, and throw everything into the slow cooker together.